Please make your herb choices by the day specified in your newsletter. Step 1: Follow this link and choose your five herbs. 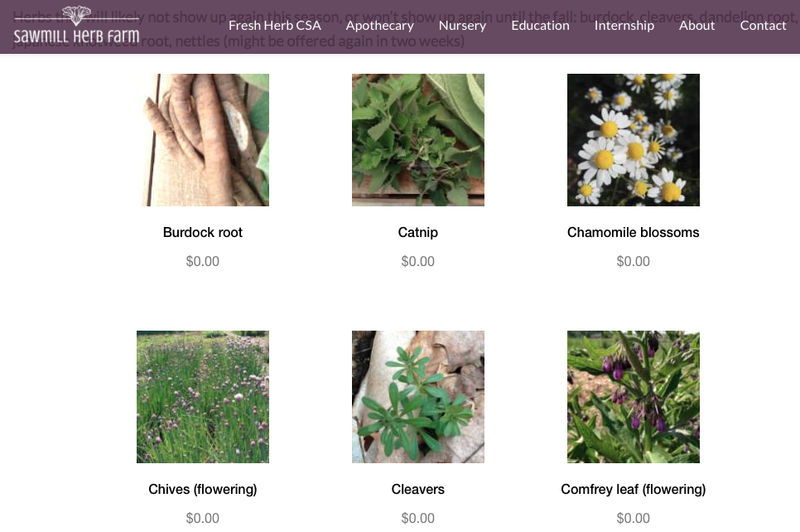 The link directs you to the page where the CSA herbs are listed. When you click on a herb you add it to your cart and then can adjust the quantity in the cart. The default pricing for the herb makes it so that when you click on the herb and add it to your cart its included as part of the share. If you want to add onto your share beyond the five herbs included, choose “bulk item” instead of “csa share” for that herb and add it to your cart. CSA items are $0 while bulk item herbs are purchased as add-ons to the CSA. If you are just getting the five herbs in your share then the total should come to $0. Step 2: Click checkout. On the checkout page you’ll have the option to login. Hit login, and click on “create an account.” Create an account with your email and password so that you don’t have to enter your information each time and then you can keep track of what you ordered. If you just chose your five herbs for the share then there will be no charge. If you purchased extra herbs you can choose to pay via credit card or you can bring a check in-person. If you want to add-on anything from the apothecary, head to the main menu and go to Apothecary >> Shop Apothecary and you can add things to your cart. We are working on streamlining this part, but for now, the program will assume the item is going to be shipped to you and will want to charge you for shipping. On the final screen enter the discount code MEMBER and that’ll take care of that. Step 3: Pick up your herbs on your pick up day! Check back on your confirmation email from when you signed up for the share in case you forgot which site you chose. If you’re unable to pick up your share last minute let us know. Sometimes we can save Tuesday and Thursday shares for you to pick up at the farm the following day. We know that summer is a busy time and people go away. Use this form to schedule a vacation hold. We will include the link in every newsletter. You enter the pick up date when you’ll be away and the date when you’d like to pick up a double share. Make sure to choose ten herbs for that pickup day. We ask that you limit holds to two per season. Generally, if you forget to choose your herbs by the deadline we don’t harvest a share for you. You can double up another time but we ask that you keep track of that as it is a lot for us to keep track of. Lots of emails floating around. If you’re someone that knows you’re not going to remember to choose your herbs, email me and I will harvest a selection of herbs of my choosing for you for every share.